Location: 4700 Highway 51 South, Hernando, Miss. On June 6, 1966, James Meredith began his "March Against Fear" from Memphis, Tennessee, to Jackson, Mississippi, to protest racism. Shortly after beginning the march, the first African-American to be admitted to Ole Miss was shot by Aubrey James Norvell while traveling along Highway 51 in Hernando, Mississippi. Meredith was taken to a hospital, and SCLC members like Stokley Carmichael and Dr. Martin Luther King, Jr. continued the march in his name. Meredith rejoined on June 25, and the march arrived in Jackson the following day. 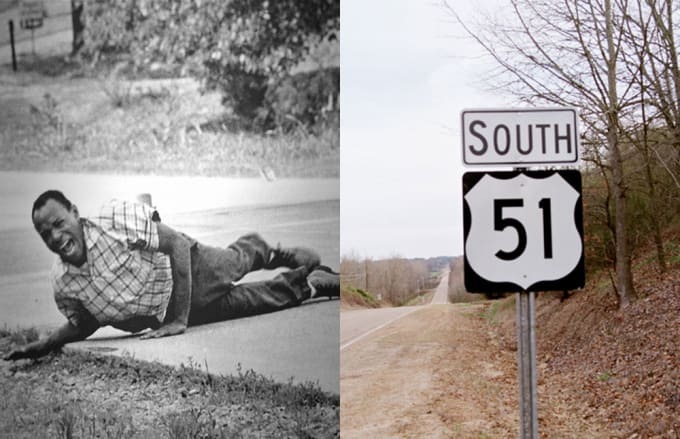 The spot where Meredith was shot, 4700 Highway U.S. 51 South, doesn't have an address, but the bushy area where Meredith and Norvell stared each other down remains largely the same. Jack R. Thornell's stunning image of a wounded Meredith won the Pulitzer Prize for Photography in 1967.